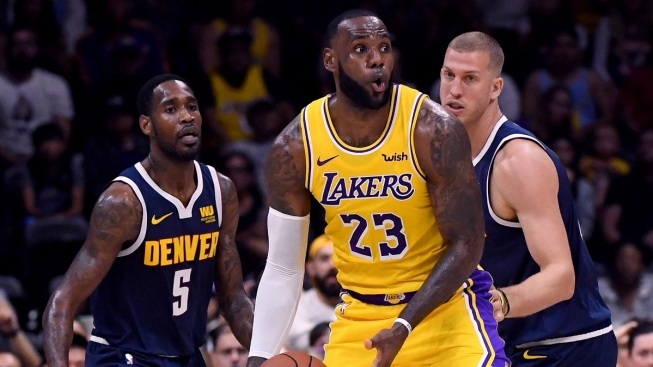 The Laker and dad of three said it's because of "how mature they are"
FILE - LeBron James, #23, of the Los Angeles Lakers looks to pass in front of Will Barton, #5, and Mason Plumlee, #24, of the Denver Nuggets during a preseason game at Valley View Casino Center on Sept. 30, 2018, in San Diego, Calif. Apparently age is just a number to NBA superstar LeBron James. The Los Angeles Laker revealed on Tuesday that he lets his 11- and 14-year-old sons drink wine with him. “Yeah, that’s how mature they are," James said in an interview with media gathered outside the team's practice facility. "They’ll be driving next week, too," he joked. James said his sons LeBron Jr., 14, and Bryce, 11, drink "whatever dad's and mom's having." The star basketball player told reporters to put all of the blame on him and not on his wife Savannah. The legal drinking in the U.S. is 21.